Go bold. Go bright. Go Full HD. Amaze your audience with Full 1080p HD. The DellTM 7700FullHD projector can deliver stunning, ultra-bright multimedia presentations in almost any lighting condition. Captivate with Full 1080p HD: Bring HD presentations to life with crisp 1920x1080p resolution. Impress with our brightest projector yet: Deliver vivid presentations in almost any lighting condition with 5000 ANSI Lumens (max). Take control: Present from a wide range of devices with multiple connectivity options, including optional wireless* functionality, dual HDMI inputs, and excellent network management. Discover a brilliant multimedia experience. Make the most of your time in the spotlight. 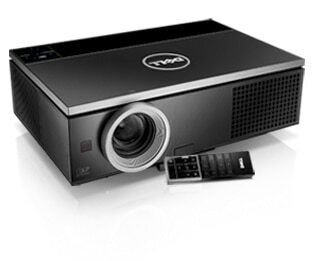 Deliver powerful presentations in Full 1080p HD with the DellTM 7700FullHD Projector. 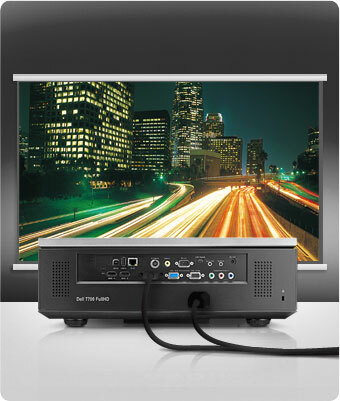 Full 1080p HD Captivate audiences with the vivid detail of Full 1080p HD (1920 x 1080p) resolution. Ultra-high brightness Make a bold statement in nearly any size venue and lighting condition with 5000 ANSI Lumens (max). Outstanding audio Add sound to your multimedia presentations with the two internal 5W speakers. Step up to executive-level connectivity. Experience superb connectivity and network management features with the 7700FullHD Projector. Employ network management control: Crestron RoomView* compatibility (software available for download) and an RJ45 connection enable remote real-time facility-wide monitoring, control and reporting of vital information such as power status, lamp life and system alerts. Go AV-cable free: Opt for advanced features that include wireless audio and 720p video file streaming (USB wireless dongle sold separately). Connect the 7700FullHD Projector with up to 30 users simultaneously using Multi-PC session and share content from up to four presenters at the same time with 4-in-1 split-screen capability. Discover outstanding connectivity: Present multimedia from a range of devices (including DVD players, Blu-ray Disc™ players and gaming consoles) with a multitude of ports, including dual HDMI, dual VGA-In, S-Video, Composite Video and Component Video. Get an easy-to-use, top-of-the-line projection solution and uncomplicated maintenance with the 7700FullHD Projector. Take control: Operate your 7700FullHD projector from a distance using the full-featured remote control and on-screen menu. Easy-to-change lamp: The easily accessible lamp on the 7700FullHD is designed to last up to 1,500 hours* in Normal mode and up to 2,000 hours* in Eco-Mode. No filter to replace: Enjoy simplified maintenance thanks to the filter-free design.